Tabanan Regency is located in the southern island of Bali, Tabanan regency has an area of ​​839.33 KM ² consisting of mountains and beaches. 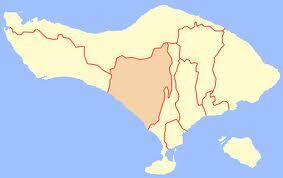 Tabanan regency is geographically located between 1140-54 '52 "east longitude and 80 14' 30" - 80 30'07 "south latitude. Tabanan Regency topography is located between an altitude 0-2276 m asl, with details on the height of 0-500 m above sea level is a flat area with a slope of 2-15%. While at an altitude of 500-1000 m above sea level is flat to sloping areas with a slope of 15-40%. In the areas that have a slope of 2-15% and 15-40% is a very fertile area where farmers conduct farming activities to make ends meet. In areas that have elevations above 1,000 m above sea level and with a slope of 40% over an area of ​​rolling hills and steep. The limits of Tabanan regency is included: in the north bordering Buleleng, bordered by a row of mountains such as Mount Batukaru (2276 m), Mount Sanghyang (2023 m), Mount Pohen (2051 m), Mountain Mill (2082 m ), and Beratan Mount (2020 m) on the east by the Badung regency, which is limited by Tukad Sungi Yeh, Yeh Tukad Ukun and Tukad Yeh Penet. To the south is limited by the Indian Ocean, with a width of 37 km long beach; in the west bordering Jembrana bounded by Tukad Let Yeh. Tabanan regency is one of nine District / City of the total area of 839.33 km2 or 14.90% of Bali province, and lies at an altitude region 0-2276 m above sea level. A total of 23 358 hectares or 28.00% of land area in the rice fields of Tabanan, Tabanan regency that is known as an agricultural area. Tabanan Regency is located in the tropics with two distinct seasons of summer and the rainy season punctuated by the transition season. Air temperature varies and is determined by the altitude, the average ranges from 27.60 C. The state of water is affected by the shape of the coast and rainfall is the source of water storage and irrigation sources in addition to the lake which covers 377 hectares located in District Baturiti.